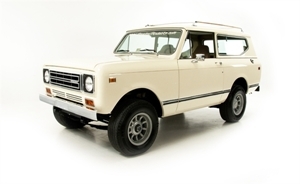 This is a 1979 Scout, owned by a local gentleman who has owned it since 1990. The engine was recently rebuilt, we had the transmission gone through, and pretty well had the rest of it apart completely. The chassis was powdercoated, along with the inner fenders, wheels and lots of other small parts. We sourced a good body tub from California, rather than do MAJOR repairs to the existing one, but still had to install new floors and quarter panels. We sprayed a truck bedliner on the bottom side of the tub, and POR-15'd the inside prior to laying the new carpet. We put power windows and keyless entry in it, and lots of other little odds and ends to make it a better driving, more modern vehicle. The owner uses it as daily transportation, and he now has a VERY nice Scout to tool around in this summer! Click the link below for more pictures and info on this build.